The VMware Big Data Extensions v2.2 release included the cookbooks for Apache Mesos and Kubernetes from the Fling released this past spring. However, those cookbooks are not exposed when you deploy the new version. Fortunately, unlocking them only takes a few minutes before they can be made available! I will cover exactly what is needed in order to begin using these Cloud Native App cluster deployments below. 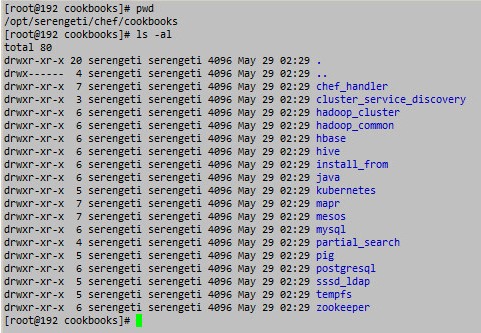 If you jump onto your v2.2 management server and look in the /opt/serengeti/chef/cookbooks directory, you will see all of the Cloud Native App additions. A quick look to be sure the Chef roles are still defined tells us that they are. They even did us the favor of including the JSON spec files in the /opt/serengeti/www/specs/Ironfan directory. The missing pieces are the entries in the /opt/serengeti/www/specs/map and /opt/serengeti/www/distros/manifest files. Those are rather easy to copy out of the VMware Fling itself or re-create manually. If you want to edit the files yourself, here is what needs to be added to the files. The repos built into the Fling are not present (unfortunately) on the management server. This was the only tedious portion of the entire process. The easiest method is to grab the files out of an existing BDE Fling management server and copy them into the new one. The other option is find the latest RPMs on the Internet and add them to the management server manually. In either case, you’ll need to run the CentOS syntax for creating the repository. A restart of Tomcat is all that is needed and then you will be able to start deploying Apache Mesos and Kubernetes clusters through BDE v2.2. If you want to take advantage of the Instant Clone functionality, you will need to be running vSphere 6.0 and BDE v2.2. There are also a couple adjustments to the /opt/serengeti/conf/serengeti.properties files that will be need to be made. I will be going over those in a future post discussing how to use the Photon OS as the template for BDE to deploy. There are a couple new versions for both Apache Mesos and Mesosphere Marathon. Since one of the great things about using VMware Big Data Extensions to handle the deployment and management of clusters is the ability to ensure control of the packages and versions within the SDLC. There were a few changes to be made within Chef to support Mesos v0.22.0 and Marathon 0.8.0* within the Big Data Extensions management server. If you choose to update the manifest file, make sure you restart tomcat on the BDE management server. You normally would be done at this point, but there were changes in where Mesos and Marathon install two files that we’ll need to account for. The old files were in subdirectories under /usr/local and are now placed in subdirectories of /usr. Update the files in the Chef server by running ‘knife cookbook upload -a‘ and you are all set. Go forth and deploy your updated Apache Mesos 0.22.0 and Marathon 0.8.0 clusters! *Marathon 0.8.1 has been released but there has not been a RPM file created by Mesosphere yet. Let me start off by saying that adding Apache Kafka into the framework of VMware vSphere Big Data Extensions (BDE) has been the most challenging of them all. Not from a framework perspective, but from a Chef cookbook and configuration one. There were a few resources for me to rely on for the overall configuration of Kafka, however many of them had contradicting statements within them. It took a good 8 solid hours of testing and re-testing the recipes before I was able to get a working multi-node Kafka cluster online. All that being said, it was important for me to get a standardized method for deploying Apache Kafka clusters within the BDE framework. I am aware of several teams that are manually configuring Kafka within an environment today, each with their own insights on how that should be accomplished and few of them are sharing their methods with one another. Frankly, I feel the lack of collaboration between teams is the biggest challenge for any large-scale organization to overcome. Very rarely is a problem too difficult to solve with technology, it is generally difficult to solve because of a lack of knowledge-sharing between teams and/or organizations. As I hope all of my readers have come to expect, the proceeding will include the JSON files necessary to add Apache Kafka into BDE, the Chef recipes|templates|libraries and a link to the GitHub repository for Virtual Elephant where you can download all of the pieces to add within your own deployments of BDE to further expand your service catalog. Apache Cassandra support has been one of the additional clustered software projects I have wanted to add into the vSphere Big Data Extensions framework. In an effort to build out a robust and diverse service catalog for our private cloud environment, adding Cassandra is one more service we can make available to our customers (which is currently in production use). Below you will find the tutorial for how to implement Apache Cassandra, with the associated JSON files, Chef cookbooks and Chef roles in vSphere Big Data Extensions. All of the files I will be going over are available in GitHub here.